Counsel for a wide range of organizations in the manufacturing, business, medical, legal and public utility industries. Calfee’s Tort, Accident and Product Liability practice provides counsel for a wide range of organizations in the manufacturing, business, medical, legal and public utility communities. The group handles all types of tort claims, including products liability, premises liability, negligence, strict liability, and intentional tort claims. We have extensive experience with conduct-based tort claims on behalf of both plaintiffs and defendants; litigating the standard of care in the medical, legal, accounting and architectural professions; and defending public utilities and other businesses in matters involving highly technical science and engineering-based issues. When tort, accident, and product liability claims arise, the attorneys in this group assist clients at every step of the way from setting up a response and investigation procedure to handling a matter at trial. Our experience in developing and identifying response procedures has enabled clients to assess, at an early stage, what happened, why it happened, and whether further incidents can be prevented. Through this, we assist clients in preserving and identifying key facts and evidence, while reducing the risk of an adverse litigation result. In addition, we provide clients counseling and assistance in making decisions regarding warnings, responses to inquiries from government agencies, subsequent remedial measures, product recalls, consumer issues, and any other issues that arise depending upon the incident, claim, product or service at issue. 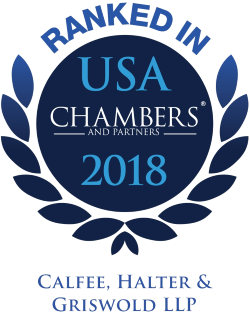 Calfee's Litigation group was selected for inclusion in the 2019 "Best Law Firms" rankings by U.S.News – Best Lawyers in America in several Litigation practice areas. Calfee attorneys operate in an environment conducive to a free-flowing exchange of information between attorney and the client, yet our attorneys are mindful of the need to maintain the protection from disclosure that the attorney/client privilege and/or work product doctrine provide. The actions of the group in counseling our clients at an early stage are designed to reduce subsequent legal costs and expenses and to place the client in the best position to defend against future claims. Reduce the amount of time employees will have to spend searching for documents and information after an incident. Reduce the risk of an adverse litigation result.